Is your blog isn’t making money (or enough money)? Let’s get real – trying to make money from blogging is hard. In fact, it’s so hard, a very high percentage of bloggers failed to generate any meaningful income from their blog in their first year – and then they quit. I started blogging since 2006 and have had my fair share of failed blogs. Over the years, I’ve learned a few things from these unsuccessful blogs and noticed they all shared a few things in common. If you feel stuck and frustrated with your blog isn’t making money, this post is for you. You may be committing one or more of the mistakes discussed below which are stifling your growth and preventing your blog from reaching its true income potential. I’ll discuss some of these mistakes and the reasons behind them along with suggestions on how to fix them so that you can start making some money from your blog! Should you write for the search engines more? During the first few months of your blogging journey, you would probably get very few visits to your blog. Most bloggers only notice some traffic from Google 6 months (or longer) after starting their blog. Thinking this would be the case forever, they might only publish new posts once in a blue moon due to the lack of motivation or even quit blogging altogether. Quitting too early is one of the biggest reasons why bloggers fail to make money from their blogs. Getting little to no traffic is quite common for most new blogs and it’s not bad luck nor it is a reason to quit. Growing a blog takes time. It’s during this time that you have to persevere, blog more consistently, even when hardly anyone is reading. 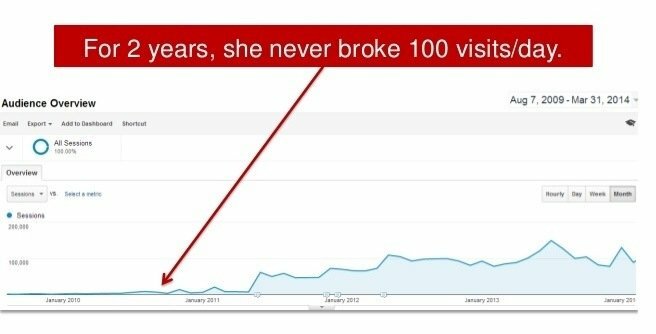 For 2 years, her blog never broke 100 visits per day. Today, she gets over 100,000 visitors each month. But what if after all these years, you’re still struggling to get visitors? Then there may be something else you are doing wrong. Geraldine’s blog is just one of many examples and you certainly do not have to wait 2 years to start getting good traffic and making money from your blog. The biggest motivation killer for new bloggers is working on something that gives no reward for their effort. But there’s a difference between hard work that won’t get you anywhere and hard work that contributes toward increasing your traffic and income. For example, just dedicating your time to writing blog posts and ignoring the promotion part is one of the biggest mistakes you could make as a blogger. In fact, you should spend 80% to 90% of your time on promotion and only 10%-20% on content creation. Check out the following blog posts to help you with this. You can expect to get little traffic and make nothing at least during the first six months. But don’t just take everything lying down. Fight for it! If you could implement the tips and strategies outlined in the posts above, you could very well accelerate your growth faster. Are you trying to make money by blogging about blogging? If you are new to blogging, I’d suggest changing your niche or at least don’t make the blogging topic as your main topic. Don’t get me wrong. While you can make money by blogging about blogging, this niche is full of highly experienced bloggers and Internet marketer. If you find a great blogging product to review, chances are, thousands of other bloggers may have written a similar article about it. To be successful, you’ll need to be very good or be different to stand out from the crowd. Besides, the blogging topic is far from being the most popular niches out there. Coupled with the tough competition, it’s a hard niche to make money from. There are tons of other more popular niches with a much larger audience and lower competition. You’d be able to stand out easier in these niches and attract traffic faster. Niching down will help you to stand out more too. For example, if you want to write about health and fitness, you need to narrow down your focus to target one specific sub-topic. You can focus on weight loss/dieting, healthy living, muscle buildings/workout and so on. Personally, I’ve made more money from other niches than from my blogging blog. It doesn’t mean that it will stay that way forever though. It’s just a bit harder to make money by blogging about blogging. If you just write about general blogging topics, you’ll need tons of traffic to make decent income from ads alone (I put ads on Sabahan.com because I love to experiment ;)). The best way to make money from the blogging niche is to sell your own products or services. Package your knowledge into info products, coaching packages or online courses. Then you can start your own affiliate program and recruit other bloggers to promote your products and services. If you want to make money from your blog, you need to write about topics that people are already searching for. People go online either to learn something, be entertained or find a solution to a problem. If you can write quality and highly relevant content that serve these needs then you just improved your chance of making good money from your blog. You can achieve this by doing keyword research. Keyword research involves finding a series of popular words and phrases that people are searching for based on your topic. Then you make an attempt to rank for them. Without conducting any keyword research, you risk writing about topics that may be interesting to you but have little to zero interest to your target audience. Have commercial intent – how profitable is this keyword? The following are several tools to help you with your keyword research. Ubersuggest is a keyword research tool by Neil Patel. It’s free to use without the need for a registration. To use it just enter your keyword in the search box and it’ll show you whether the keyword satisfies the criteria above. For example when I entered “make money blogging”, I can see its search volume, keyword difficulty and commercial intent. Search volume – at 18,100, this keyword has a pretty good monthly search volume. Cost Per Click (CPC) – this is the highest price an advertiser would pay to rank for this keyword in Google Ads. The higher the CPC, the better the commercial intent would be. Trying to find good keywords can take you all day and there’s no guarantee you’ll find good ones unless you know what you are doing. This next tool will solve this problem. What if you could ‘spy’ any blogs in your niche and find the exact keywords they are ranking for? You can sort of reverse-engineer any blogs and discover new keywords that you may be able to rank yourself. To find the organic keywords a site are ranked for, I use KeySearch Organic Keywords feature. Just to give you an example, I entered Raelyntan.com and found all the keywords her blog are ranked for on Google. Exact URLs that rank for those keywords. If Sabahan.com has the same domain authority level as Raelyntan.com, I could easily target similar keywords and could probably rank in the top 10 for those keywords too. As you can see, this can be a very powerful and quick way to find good keywords to target. KeySearch is one of the cheapest professional keyword research tools out there. It’s the tool I’m using for my own keyword research. It costs $17/month, but you can use the following coupon code to get 20% off so you’ll only pay $13.60 monthly until you cancel or upgrade your plan. If you are serious about using SEO to drive organic traffic to your blog and don’t want to spend $99 per month, then KeySearch is the best keyword research tool for you. Learn more about KeySearch here. It’s one thing to do keyword research, it’s quite another to optimize your blog posts using those keywords so that you rank on Google’s first page results. You can only rank properly by knowing how to implement good search engine optimization (SEO) tactics. Don’t worry though, this is not as complicated as it sounds. When it comes to making money from your blog, there are certain types of posts that could potentially make you more money. You need to create posts that answer questions or offer solutions to problems your readers may have. For example, you can write about any of the following topics and weave affiliate products/services within the post. You can learn more about these post types here. Just because you write about a topic and place an affiliate link doesn’t mean people will click and buy from you. If the content is not related to what your readers are looking for, nobody will buy or sign up for the offer. For example, placing banner ads about diapers and baby products on a page about blogging won’t get you many if any sales. To learn more, check out my other post where I share tips on selecting the best affiliate programs for bloggers. Truth be told, I dislike reading an income report only to discover it’s no more than a thinly veiled hosting/affiliate sales pitch. At other occasions, some posts claim to reveal the secrets to gaining a gargantuan number of visitors to your blog. Yet there’s actually very little insight to gain from them – unless you buy the recommended course(s). But do you know why you see these types of posts all over Pinterest? Because they convert and people, especially newbies, are actually reading and believe in them. You see, these posts focus on a pain point the reader may have. A pain point is a problem, real or perceived. In this case, how people struggle to increase blog traffic and make money from blogging. The opportunities come when you provide solutions to those pain points. Instead of sharing the values in the blog post for everyone to see, you offer solutions in the form of courses, products or services. Like it or not, this is part of marketing/trying to make money from a blog. If you push too hard, you’ll end up alienating your regular readers (but newer blogs don’t have to worry too much about this because there’s likely very few regular readers). If you don’t promote any products or refuse to address the readers pain point for fear of sounding too salesy, insincere or manipulative, you will make less money. The trick is to find a balance between providing actual value in your post and trying to sell something when the actual value is elsewhere. You can do both! If you decide to create an income report for instance, just be honest with your numbers. Don’t show fake figures just to get people’s attention. It used to be quite easy to get rank on Google. But as time goes by, Google continues to update their algorithm making it harder and harder to rank. Sites that failed to adapt fell in rankings and lose their traffic. Just by being aware of what the general trend brought by each update allows you to produce content that satisfies Google requirements. Google penalized spammy tactics include keyword stuffing, invisible text, using multiple sites under the same brands. Reduced rankings for low-quality sites and those with copy content from other websites. At the same time, it improved rankings for high-quality sites with original content, in-depth reports and thoughtful analysis etc. This is the webspam algorithm update which specifically targeted link spam and manipulative link building practices. Hummingbird is one of Google’s major updates. Its goal is to increase understanding of the true intent behind user’ searches. If your content answers the user’s question, you will likely rank for several keywords instead of just string of keywords the user searched for. This update introduces machine learning to Google algorithm. It monitors user behaviour and responses to queries to learn more about the user’s intent and the value of certain pages. It’s now Google’s 3rd most important ranking signal. While all the updates may seem technical, at the end of the day they are geared towards improving the user experience and helping users find answers to their queries. Your job as a blogger is to create high-quality content that will answer these queries and engage them at every stage of their buyer’s journey. If you are using Facebook as part of your social media marketing strategy, you’ll need to pay attention to their updates in order to boost your organic reach. In 2018, Facebook algorithm places more priority on content around individual’s friends and family members rather than posts from businesses with. The goal is to drive more authentic interactions. As a blogger, you can start creating quality content that drives real interactions and shares. Add fewer links, more photos and tags. Facebook prefers it if your content keeps users on their platform. Focus on Facebook groups more than pages. Let’s say you want to start a coffee shop. What would you do in order to make it grow and generate an income? Can you..
Just turn up for work when you feel like it? Focus on other things while running that business? Can your business grow if you avoid investing money in it? Would it be acceptable to ignore your customers? The answer to each question is, of course, a resounding no. You would go through all the blood, sweat and tears trying to ensure your business venture is successful, right? Your whole life would revolve around your coffee shop. Blogging is the same in that you have to run it like you would a business. But that could be hard simply because it’s online and all you do is sit in front of the computer screen. How can you know what to do and how to do it? How can you measure your results? You need to get your own domain name and a self-hosted blog (avoid the free blogging platforms). Get a good theme to make your blog looks professional and improve your branding. You’ll also require other expenses as part of your marketing budget. You may need to spend money on social media automation tools, purchasing Facebook ads, email marketing software, hire a virtual assistant and so on. Fortunately, these things won’t have to cost an arm and a leg. For ideas on tools and resources to help you build and run a successful blog, check out my Blogging Toolbox. If you are new to blogging, you may want to invest in a blogging course. Wait, actually that’s not even necessary because you can learn almost anything for free online. The problem with trying to scour the Internet and figure out everything by yourself is that you will get overwhelmed fast. Where can you find reliable information? Do you know what you need to learn at different stages of your blogging journey? How about all the distractions and misinformation you’ll come across along the way? Isn’t it nice if you have an easy to follow, well-organized information at your fingertips? If you have the time and are willing to experiment by trial and error, by all means, do it. But sometimes the mistakes can hinder your progress and may prove costly. Personally for me, I’m a self-taught guy. I’ve never taken any blogging courses or purchased blogging ebook in my 12 years of blogging. (I’ve bought many other ebooks/guides besides learning how to blog though). That said, recently I decided to purchase Elna Cain’s Ready Set Blog for Traffic because I wanted to learn about Pinterest quick. It did help me increase my Pinterest monthly viewers to over 60,000 in just over a month. Ready Set Blog Traffic is more than just a Pinterest guide though. In fact, the Pinterest guide is just one of the 5 modules available in the course. Other modules teach you how to build a solid foundation for your blog, learn some SEO strategies and learn how to create income-generating content. If you want a good introduction to blogging, how to get traffic and make money, this course is probably for you. Click here to learn more about Ready Set Blog Traffic. I am always open to learning new things faster and may purchase more courses in the future. You have to make time for your blogging business. Start waking up early at 4 or 5 am and find that time. Work on your blog on lunch breaks, evenings or weekends. Now I don’t want to tell you what you should or shouldn’t do when it comes to managing your own time. You probably have a full-time job and have other time-consuming commitments. My only question is, how bad do you want to make money and be successful? Only you can answer that question! They said the money is in the list. That’s true but you don’t actually need an email list in order to make money from your blog. If you get highly targeted traffic from Google, you WILL make money right away with less effort. But there’s only one problem with this approach. What will happen if Google or the social media decided not to send you any more traffic? Your blog will stop generating income overnight. Having an email list makes you less dependent on traffic coming from Google and the social media platforms. It is probably the most important asset you’ll ever have as a blogger. Your email list is yours to keep. You can bring your audience anywhere with you no matter what happens to your blog traffic or social media accounts. You can continue to nurture the relationship and continue to market relevant offers over and over again. Compare that to traffic you get from Google, unless the visitor becomes a regular reader, you only have one chance to market your offer. Related: Learn how to start your email list for free. If you’ve just started your blog, I would recommend focusing on content creation first. Remember, your readers will only sign up if they see you have something valuable to offer. Once you have enough good content then you can start adding the email opt-in forms into your blog and start collecting visitors’ email. The reason why I recommend you to do this later (one or two months after starting) is that you will spread yourself too thin trying to do everything at once. But you MUST start your email list even when you don’t know what you want to talk about in the email. You don’t have to send out regular newsletters right away. Just start collecting email addresses. You can’t expect a full-time income by putting a part-time effort. Be prepared with the amount of time and effort you’ll have to put in to make this blogging thing work. If you want this bad enough and put in the work, you will make money from your blog. If you blog isn’t making money, I hope you find some tips and tricks from this post that you can implement to improve your odds. Making money from a blog won’t happen overnight. At times, the going will get tough, and only the tough will get going. By following the right techniques and implementing the right tactics, plus lots of perseverance and dedication, I believe anyone could start making money 6 to 12 months after starting a blog. 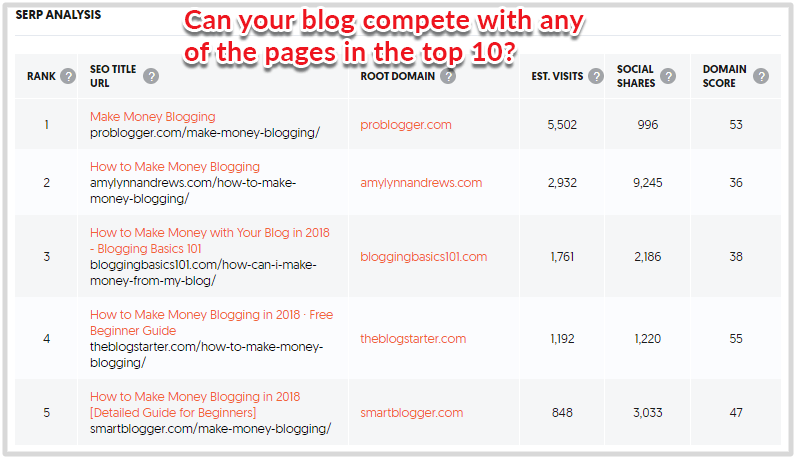 Are you already making money from your blog? If you are, how long did it take you to make your first income? If not, why? Please share your story in the comments! I came here from the group on Facebook and yes, you’ve brought out all these points which is great. Trust me point #9 crowns it all. If we treat blogging as a real business, we will do the other things right? That’s right Enstine. People should treat blogging like a business if they expect a business like income from it! Thanks for stopping by! Awesome post! I’m in no hurry to make money from my blog but grasping affiliate marketing and promoting is still something I’m working on — thanks for the motivation and tips! Hey Kayla, you are welcome. Glad you find the post useful! I definitely needed to read this! I’ve been struggling building traffic and since creating a bit different content than I did starting out, traffic has gone up! That’s great Amanda. I hope you’ll get more traffic as you create more content. Thanks for the comment. Awesome article Friend, really informative. Thanks Santosh. Glad you find it useful!